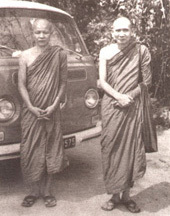 Luang Ta Maha Boowa Yannasampanno was born in Udornthani, North-east Thailand in 1913. He became a monk in the customary way at a local monastery and went on to study the Pali language and texts. He did, however, also start to meditate at this time but had not yet found a suitable teacher. Then he caught sight of the Ven. Acharn Mun and immediately felt that this was someone really special, someone who obviously had achieved something from his Dhamma practice. After finishing his Grade Three Pali studies' he therefore left the study monastery and followed after Ven. Acharn Mun into the forests of N.E. Thailand. When he caught up with Ven. Acharn Mun, he was told to put his academic knowledge to one side and concentrate on meditation. And that was what he did; often going into solitary retreat in the mountains and jungle but always returning for help and advice from Ven. Acharn Mun. He stayed with Ven. Acharn Mun for seven years, right up until the Ven. Acharn's passing away. The vigour and uncompromising determination of his Dhamma practice attracted other monks dedicated to meditation and this eventually resulted in the founding of Wat Pa Bahn Tahd, in some forest near the village where he was born. This enabled his mother to come and live as a nun at the monastery. Ven. 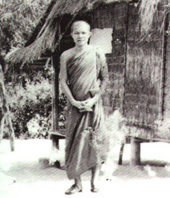 Acharn Maha Boowa is well known for the fluency and skill of his Dhamma talks, and their direct and dynamic approach. They obviously reflect his own attitude and the way he personally practised Dhamma.This is best exemplified in the Dhamma talks he gives to those who go to meditate at Wat Pa Bahn Tahd. Such talks usually take place in the cool of the evening, with lamps lit and the only sound being the insects and cicadas in the surrounding jungle. He often begins the Dhamma talk with a few moments of stillness-this is the most preparation he needs-and then quietly begins the Dhamma exposition. As the theme naturally develops, the pace quickens and those listening increasingly feel its strength and depth. The formal Dhamma talk might last from thirty-five to sixty minutes. Then, after a more general talk, the listeners would all go back to their solitary huts in the jungle to continue the practice, to try to find the Dhamma they had been listening about-inside themselves.